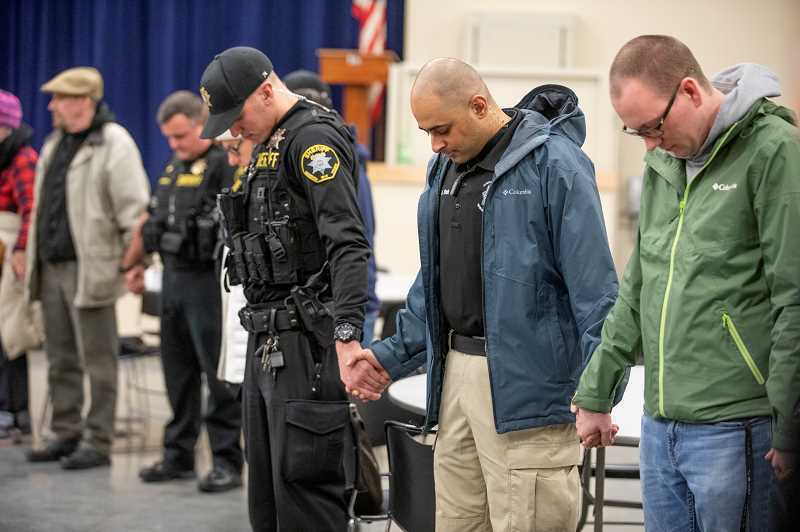 More than 65 police officers, sheriff's deputies and historically underrepresented members of the community packed into St. Anthony Catholic Church's Parish Hall Monday evening to share a meal and chat about whatever was on their minds. 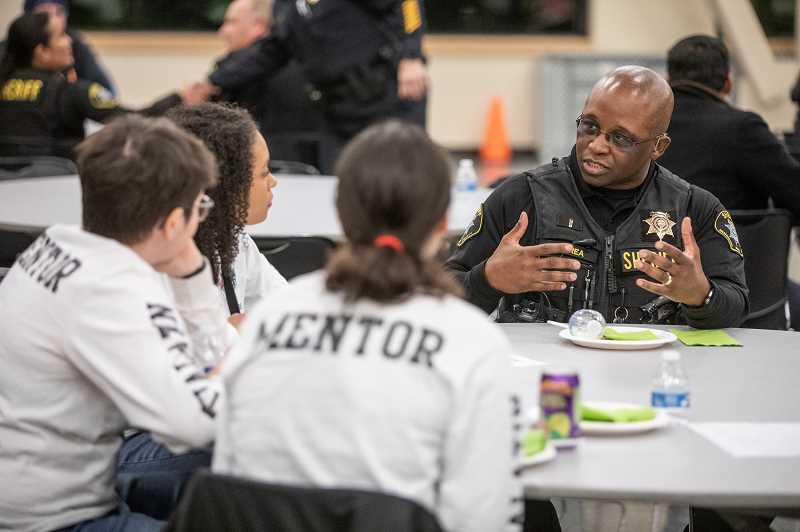 The first Community Dinner event, coordinated by the Tigard Police Department, the Washington County Sheriff's Department and the Community Engagement Program, was a chance to let those attending get an up-close and personal look at law enforcement in a relaxed environment. Sam Sachs, founder of the Portland-based No Hate Zone, whose mission is to advocate for racial equality, kicked off the evening by talking about how he started the community dinners as a way to deal with his frustration with what he thought seemed like hatred between two groups — people of color and the police. He thought bringing everyone together for a meal would provide a way for the two groups to talk. 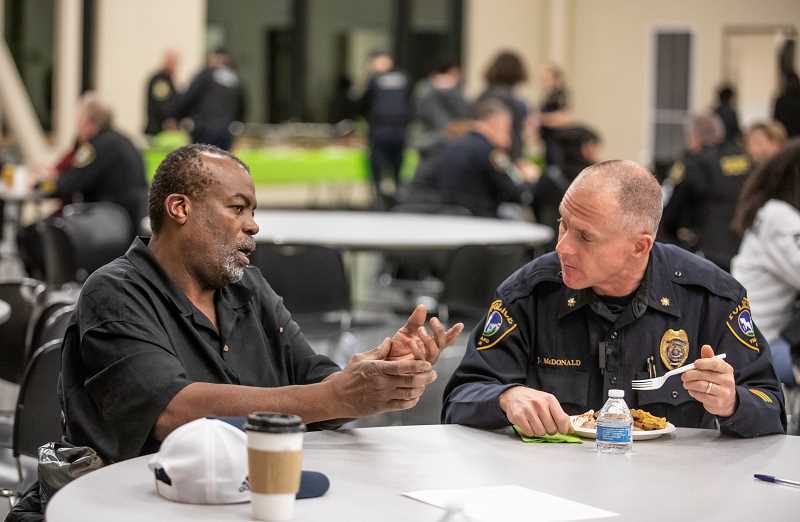 "We want to create a more intimate face-to-face discussion," he said of the Portland dinners, which he thinks are important events where the community can see that the majority of officers are honest, hardworking individuals. "We've been doing them 2½ years," said Sachs, who said anyone is invited but they have typically focused on communities of color. "We've had close to 30." 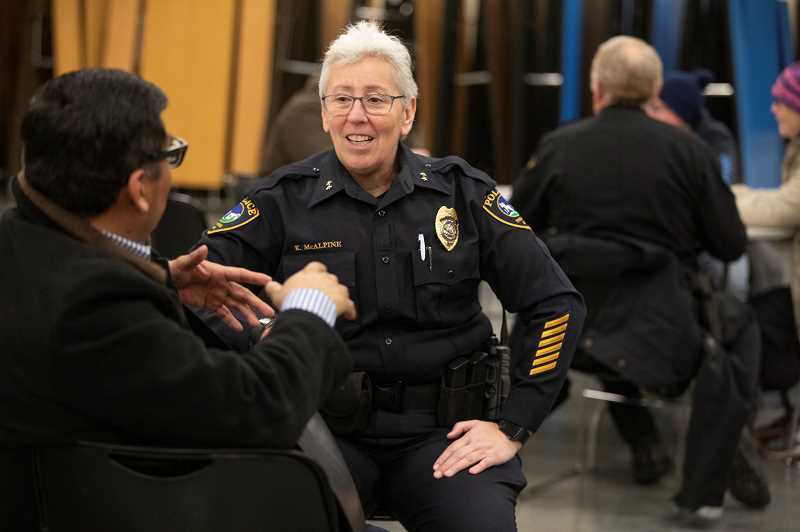 Sachs, who served as a City of Portland Human Rights Commissioner from 2013 to 2015, said he was approached by both Tigard Police Chief Kathy McAlpine and Washington County Sheriff Pat Garrett to put on a similar event, which is believed to be the first of its kind in the county. Sachs said over the years he has found that some of those in law enforcement haven't grown up associating with people of color, something he hopes to change. Noho Marchesi, owner of Noho's Hawaiian Café in Portland and Medford, has been a supporter of the dinners since their beginning, and has donated food for the No Hate Zone dinners. Monday's gathering was no exception as attendees chowed down on Hawaiian plate lunch fare with law enforcement sitting with the community at numerous round tables throughout the parish hall. 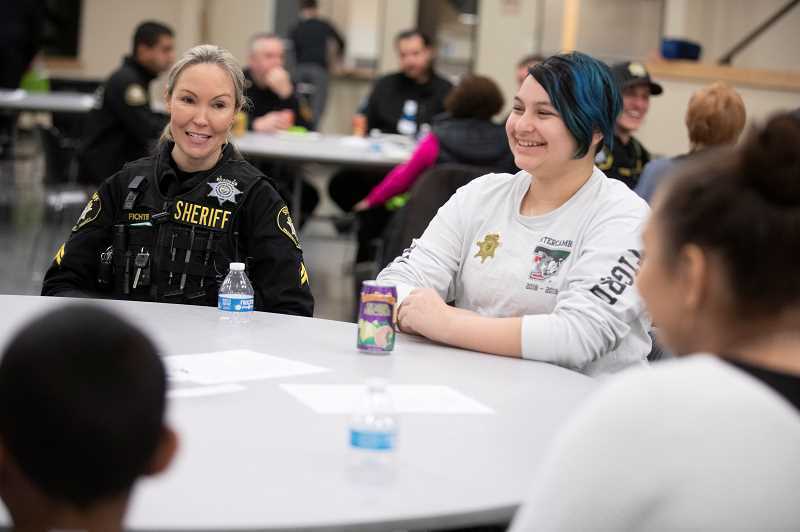 Corporal Theresa Fichter, a Washington County Sheriff's deputy, joined students from Tigard High School at one table. Fichter said she thought the dinner was going great, noting she was talking to a part of the community she doesn't normally see when she's called out to incidents. Luna Pelaez, 17, said she found the evening interesting and "really cool." "I think it's great," said Jackson Fisk, 16, a fellow student at the table. "They're fostering such positivity." She said she felt half-way comfortable at the venue, or "as comfortable as any teen is in talking to adults. "Likewise, Layaal Khellah, 16, said she found the evening and officers/deputies not to be intimating at all. "Everyone was approachable," she said. Sheriff Garrett said he brought 10 deputies to the Community Dinner. He too said there are plans to finalize a similar dinner in the Aloha area in the future, likely focusing on at-risk youth of color. Tigard Chief McAlpine brought seven officers and a civilian staff member to the event. With a cold night on tap and plenty of Hawaiian food, the chief also invited residents of St. Anthony's warming shelter to the event and said about six took her up on the offer. So will Tigard hold similar dinners in the future? "Oh definitely," said McAlpine. "I'm really interested in reaching Tigard residents (and) I'm really encouraged on what I see today and hope to do more." Also attending the dinner was State Rep. Margaret Doherty, a Tigard Democrat representing Oregon House District 35. "I'm very impressed," Doherty said of the evening. "This is what community is and I love it." Doherty said she queried law enforcement officers at her table about why they got into the field law enforcement and most told her it was because "I wanted to help people." While it's hard to measure the outcome of the dinners, Sachs said one successful outcome came from a Portland dinner that included attendance by six self-described Chicanos who didn't want to sit with police officers but later reported they found it interesting that they observed officers laughing. Deciding to come again to a follow-up dinner but unable to find a ride, Sachs had an Uber pick them up to take them to the event. He checked in with them later as the event was winding down. "I asked them if they needed an Uber ride home and they said (no), the cops are giving us a ride home," Sachs said.